If losing weight — and keeping it off — has been a constant battle for you, we’ve got good news. The Setpoint Diet book has just been published to rave reviews. Everyone is talking about the phenomenally successful 21-Day Challenge included in The Setpoint Diet book. And once you try this diet, you’ll be talking about it, too. You see, The Setpoint Diet book and the 21-Day Challenge will help you finally win the battle with your weight. What’s so Special about The Setpoint Diet Book and the 21-Day Challenge? The Setpoint Diet book, written by New York Times bestselling author and founder of SANE Solution, Jonathan Bailor, is NOT a typical diet book. It does not repeat old beliefs or myths about dieting and weight loss. Rather, the information you’ll find in The Setpoint Diet book is based on more than 15 years of verifiable research. This information comes from hundreds of peer-reviewed clinical research studies and medical journals. In writing The Setpoint Diet book, Jonathan left nothing to chance. Every fact is backed up by solid metabolic science. This research is so solid that the plan included in The Setpoint Diet book is the only plan endorsed by top doctors at the Harvard Medical School, Johns Hopkins, the Cleveland Clinic, the Mayo Clinic, and UCLA. 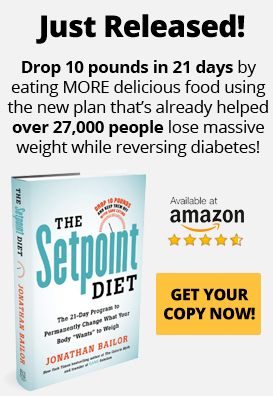 The Setpoint Diet book eating plan has not only been proven clinically to unclog hormones, brain, and digestion, but more than 100,000 people can attest to its success in lowering their setpoint weight and reversing many health issues. These individuals enjoyed effortless and now permanent weight loss — thanks to the dietary and lifestyle upgrades you’ll discover in The Setpoint Diet book. You can achieve the permanent weight loss results you desire just by following the dietary and lifestyle guidelines detailed in The Setpoint Diet book. However, the 21-Day Challenge portion of the book is useful and valuable because it helps you become quickly accustomed to living SANEly. The 21-Day Challenge protocol helps lower your setpoint weight as quickly, safely, and easily as possible. And guess what? You’ll drop those pounds without calorie counting, deprivation, or hunger. We’ll review some of the main principles of the 21-Day Challenge later. But first, let’s discuss some of the reasons your previous dieting efforts did not work. If you’ve struggled with your weight, you undoubtedly have some experience with starvation dieting. This doesn’t mean you went without food for a period of time. Rather, starvation dieting simply means that you deprive your body of an adequate number of calories. Calories are units of energy. Your organs, tissues — and every cell of your body — needs a certain minimum amount of energy (calories) to function properly. Any diet requiring you to consciously cut calories while disregarding calorie quality is a starvation-type diet. These diets incorporate the calorie-deficit theory of weight loss, a theory that is incorrect, at least in the way it is being practiced. When you finally go off the diet and start eating normally again, you gain the weight back due to the lowered metabolism — and lowered setpoint weight — caused by the starvation diet. The only way to keep the weight off after a starvation diet is to continue eating a similarly low amount of calories. But even then, you’d have to eat a smaller and smaller number of calories with each subsequent year to maintain that weight loss. This is completely unsustainable. The only way to lose weight permanently is to lower your setpoint weight. Once you lower your setpoint weight, your body will fight to keep you from gaining weight in the same way as it now fights to keep you from losing weight. You’ve been told your entire life that calories are the most important thing to weight loss and weight maintenance. You’ve been told that eating less and exercising more is the key to winning your weight loss battles. But that advice has worked for very few people — and that’s because calories are not the most important thing to weight loss/maintenance. Setpoint weight is the main factor in being able to lose weight long term. So What Is Setpoint Weight and How is it Connected to Obesity? The human body is a beautifully complex biological machine. Your brain, your digestive system, and your hormones all work together through a highly coordinated system to help stabilize your body weight —the same way they automatically stabilize your body temperature and blood pressure. They talk to one another through various feedback loops to synchronize the activities that automatically maintain body fat at a specific level, otherwise known as your setpoint weight. Think of the biological feedback system that establishes your setpoint like the thermostat in your house. Thanks to the thermostat, your heating or air-conditioning system respond to the weather outside and keep your home at whatever temperature the thermostat “thinks” it should be at. Similarly, your setpoint stimulates or suppresses your appetite and raises or lowers metabolism in response to how much fat it “thinks” you should store. This is why starvation dieting works against you. Your body fights against anything that takes you too far away from your setpoint weight. Working with your setpoint weight instead of against it — as you’ll learn in The Setpoint Diet book — is an empowering way of eating and living that will unlock the naturally slim and healthy person inside you. Eventually, you will burn calories like a naturally thin person. There are three factors that determine setpoint weight: brain, gut, and hormones. The hypothalamus in the brain regulates your metabolism, balancing calories in with calories out so that you never become too fat or too thin. The hormones leptin and insulin regulate the hypothalamus. (These hormones regulate appetite and eating.) Both of these hormones send signals to the hypothalamus regarding the status of your fat stores. A healthy brain receives these signals correctly so that when calorie intake increases your body simply burns more calories. However, if the hypothalamus becomes inflamed (neurological inflammation) it cannot receive these signals from the hormones. Instead of working to keep you naturally slim, your hypothalamus and hormones instead work to hold on to extra fat, no matter how hard you try to lose the weight. The human body is composed of an estimated 100 trillion cells, only 10% of which are human. The rest of these cells, some 90%, are bacterial — most of which live in your digestive system. Once thought to just affect digestion, gut bacteria has been found to affect the immune system, and thus may play a role in the development of every disease. As concerns weight issues, bacteria residing in your gut and digestive tract exert a major influence on your setpoint weight. Collectively called “gut microbiota,” these bacteria are responsible for a variety of tasks. For instance, they help extract calories from the foods you eat. They also store calories for later use as body fat. Some of these bacteria even have an impact on neurological inflammation and whether or not you become obese. Research shows that overweight individuals have a different mix of gut bacteria than “normal” weight individuals, too. For instance, bacteria from the Firmicutes family produce a higher setpoint while bacteria from the Bacteroidetes family produce a lower setpoint. What does this mean? In simple terms, data suggests people who are overweight or obese have a significantly higher level of Firmicutes and lower level of Bacteroidetes compared to people of “normal” weight. In essence, then, the tendency toward a higher setpoint weight — and obesity — could well begin with your gut bacteria. Science suggests that an imbalance of “good” and “bad” gut bacteria, a condition called gut dysbiosis, could well be the cause of weight gain and obesity. Released by the endocrine glands, hormones are chemical messengers that travel through the bloodstream to tissues and organs. They control most of the body’s major system, including the metabolism. If you’ve had trouble losing weight and keeping it off, a “hormonal clog” could be to blame. When you have a hormonal clog, your brain can no longer receive correct signals from your hormones that would otherwise enable you to burn body fat automatically. This elevates your setpoint weight — and keeps it elevated. An easy way to understand how this hormonal clog elevates your setpoint weight is to think about your body as functioning like a sink. When a sink is working correctly, the more water you pour in, the more water drains out. This properly working sink is balancing the water level at a low level. Think of a working sink, then, as having a low setpoint. A hormonally healthy body works similarly, doing everything it can to automatically prevent excess body fat from accumulating. A healthy body, like a “healthy” sink, responds to more in with more out, and to less in with less out. The only reason water builds up in sinks and fat builds up in bodies is that they have become clogged by having the wrong quality of things put into them. Once you have a clog, though, any amount of water IN will cause the water level to rise and stay high. Now you have a sink with an elevated setpoint. You can think of your body in the same way. When you put poor quality food into it, your body becomes hormonally clogged, causing it to automatically balance you out at an elevated level of body fat. The easiest, most efficient way to deal with this problem is not to cut calories but to remove the hormonal clog. Once you remove the clog, your body will then balance you out at a lower setpoint weight. The main causes of neurological inflammation, gut dysbiosis, and hormonal dysregulation — that lead to an elevated setpoint weight — are poor-quality diet, stress, and sleep deprivation. The Setpoint Diet book address all of these causes, providing scientifically proven strategies that will improve or eliminate these issues. Here are some important strategies you can use today to lower your setpoint weight. The Setpoint Diet book details these strategies, and many more! Reduce consumption of heavily processed foods, starchy carbs, and sugars. Increase consumption of non-starchy vegetables. Concentrate on these 3 SANE food groups: non-starchy vegetables, nutrient dense proteins, and whole-food fats. Get 7-8 hours of uninterrupted sleep per night. You’ll be perfectly fine if you decide just to implement all the strategies contained in the Setpoint Diet book. If you do so, you can expect to steadily lower your setpoint weight. But if you want to see quicker results — and develop the SANE lifestyle more quickly — you’ll want to try the 21-Day Challenge. This therapeutic, setpoint-lowering plan will transform your life. It will show you how easy it is to incorporate SANE foods and SANE living into your lifestyle. The 21-Day Challenge gives you all the tools you need to lower your setpoint weight in the quickest, easiest, and safest way possible. During the 21-Day Challenge, you will never feel hungry. You will never feel deprived. You will experience the freedom of eating real, delicious foods without worrying about calorie content. You’ll have more energy than you’ve ever had before. Your mind will be clearer. You will feel better than you’ll ever feel. And…you will likely lose 10 pounds or more in just 21 days. Without starvation. Ready to get started? Simply click here to order The Setpoint Diet.